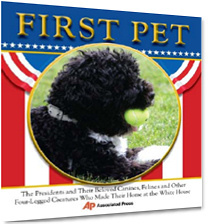 First Pet, by The Associated Press, is a collection of revealing photographs that celebrate the poignant connection between pets and presidents and allows a gratifying glimpse behind the politics that animal lovers and history buffs alike will appreciate. First Pet is a collection of words and photographs documenting U.S. presidents and their pets. Drawn from the AP’s voluminous photo library and its online photo archive of more than 7 million images, this book memorializes the special relationship of presidents and their pets over the years. 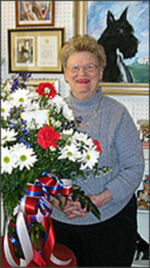 Claire McLean, founder of the Presidential Pet Museum. Whether iconic or unknown, all these photographs share a fascination with the first family’s pets. From FDR and his Scottie Fala, to Richard Nixon and his cocker spaniel Checkers, to the Clintons’ cat Socks — as well as some of the more obscure pets the White House has hosted, such as sheep, goats, raccoons, and even hummingbirds — this book highlights our presidents and their pets in a way that appeals to animal lovers, regardless of party affiliation. First Pet, by The Associated Press, with an Introduction by Claire McLean.